You can delete the job from configuration and also instruct Enterprise Manager to delete backup files created and stored in the repository by this job. Expand the menu commands by clicking Job, then select Delete. Then you will be prompted whether to delete backup files, too. To delete them, select the corresponding check box and click Yes to confirm the operation. 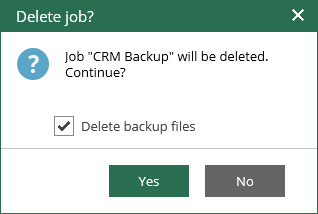 Information about deleted jobs will be removed from Veeam Backup configuration database (and Enterprise Manager database, as well), and these jobs will no longer appear in the UI. If you agreed to delete backup files, they will be removed from backup repository. 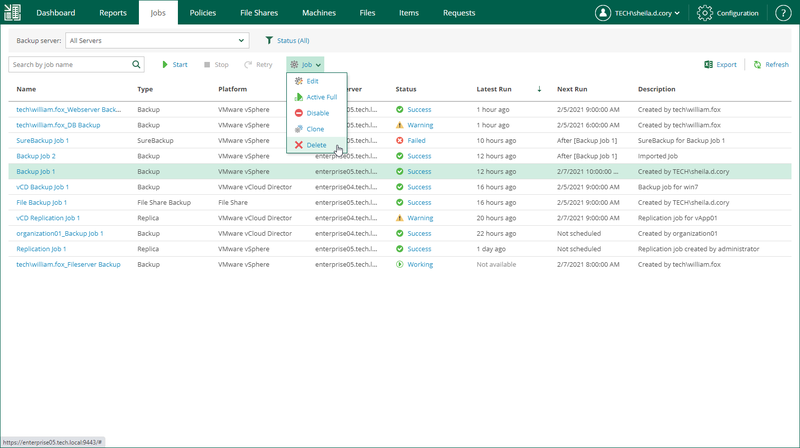 This feature is supported for Veeam Backup & Replication 9.5 only, so if you have backup servers of earlier versions, also managed by Enterprise Manager, this operation will not be available for their jobs.